US steel producer Big River Steel (BRS) has commissioned SMS group with the expansion of its steel plant in Osceola, Arkansas, USA. 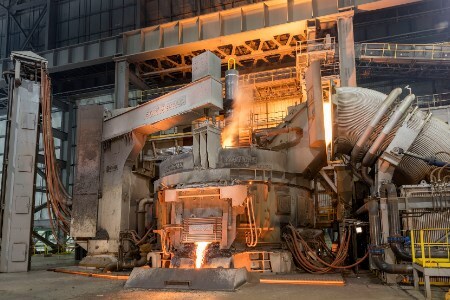 Since commissioning of the new mill in 2017, Big River Steel has been producing high-quality steels, including tube grade sheet for pipeline construction, silicon steels for a wide variety of energy and electric motor applications, and advanced high-strength steels for the US automotive industry. SMS group will again supply BRS with mechanical equipment, electrical and automation systems, and digitalisation. The expansion will increase the plant’s annual output to approximately 3 million t of steel. After completion of the next expansion, the steel plant will have two electric arc furnaces and two twin-ladle furnaces. Installation of an additional gas cleaning system will ensure compliance with the strict environmental legislation. A second strand, a second tunnel furnace and a further downcoiler will be added to the CSP® plant. Big River Steel’s CSP plant produces up to 1930 mm wide coils, making it one of the widest CSP plants in the world. The hot coil produced in the CSP plant is processed into high-grade cold strip in the downstream coupled pickling line/tandem cold mill. Also as part of this project, the continuous galvanising line (CGL) will receive an additional coiler. For all the newly installed plants, SMS group is going to supply the mechanical equipment and the X-Pact® electrical and automation systems, including level 3. Also in the second construction stage, the Product Quality Analyser (PQA®) system developed by SMS group company MET/Con will be a central module of the process automation system. By capturing and evaluating all relevant production data on a continuous basis, PQA monitors, documents and assures the product quality down to the finished cold strip along the complete production process. The system uses stored rules defined on the basis of expert knowledge to assess the coil quality in a semi-automatic procedure and, based on these assessments, takes ‘ship’ or ‘block’ decisions for the downstream processing of the strip or its dispatch. The system sends instructions for action to the operators while production continues in order to make them aware of any onset of irregularities within the production process and suggest countermeasures to be taken. This allows the operators to predictively intervene in the process before an incident becomes a problem, dramatically reducing the occurrence of failures along the production process which otherwise might have resulted in poor quality and downtimes. In the long run, the system provides higher yield while increasing the product quality. The expansion project is rounded out by SMS group’s technical service which includes, among others, spare part management services.